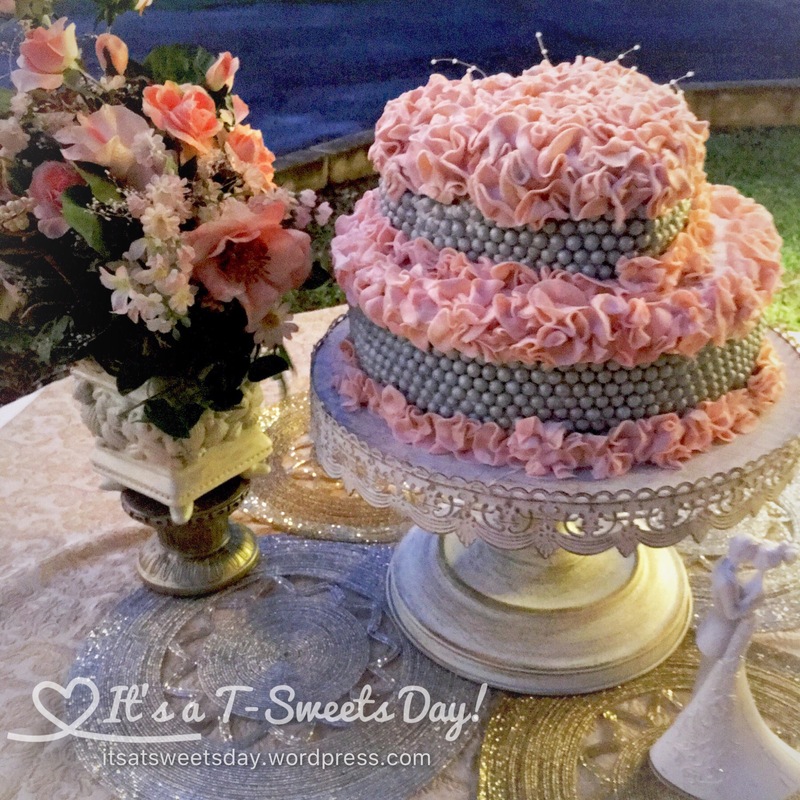 Weslie’s Wedding Cake –Ruffles and Pearls – It's a T-Sweets day! 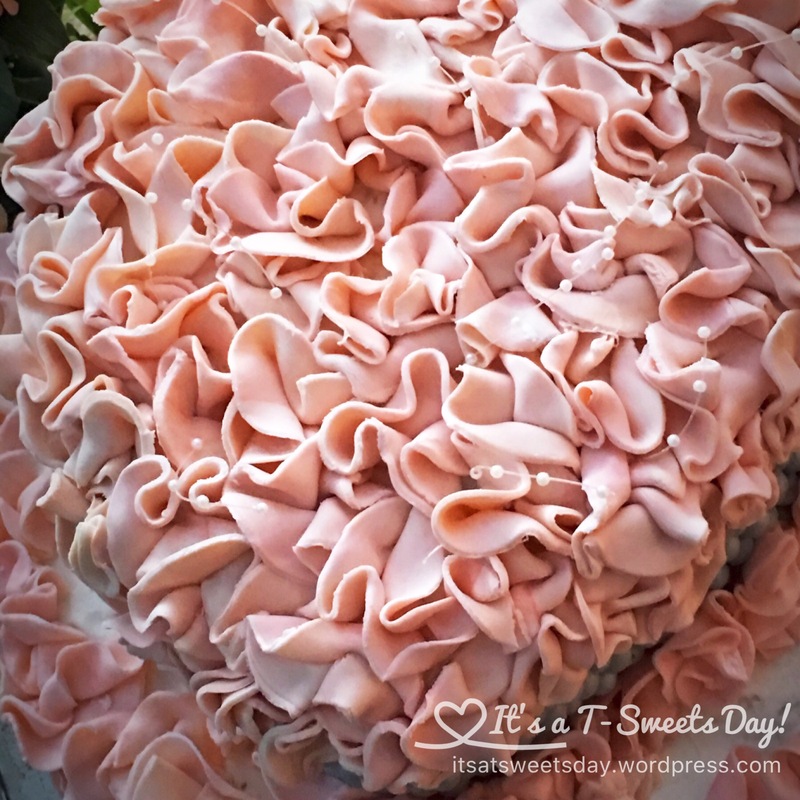 Published on August 15, 2016 August 15, 2016 by Tracy @ It's a T-Sweets Day! Good Monday Morning!! This weekend was my niece’s wedding. Yea! I was happy to make her cake:). The top tier was a coconut cake with a coconut cream filling. The bottom tier was a lemon cake with a peach mango glaze and a lemon curd filling. Yum! 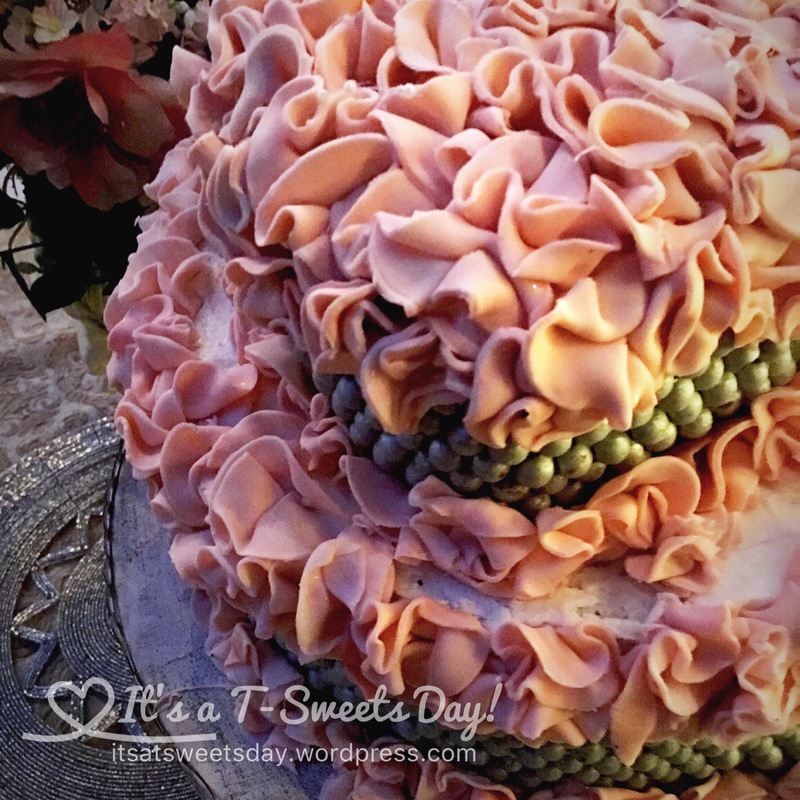 The beads on the sides were silver sixlet candies that I gently pushed into the butter cream frosting underneath. Let me tell you what, that took patience! 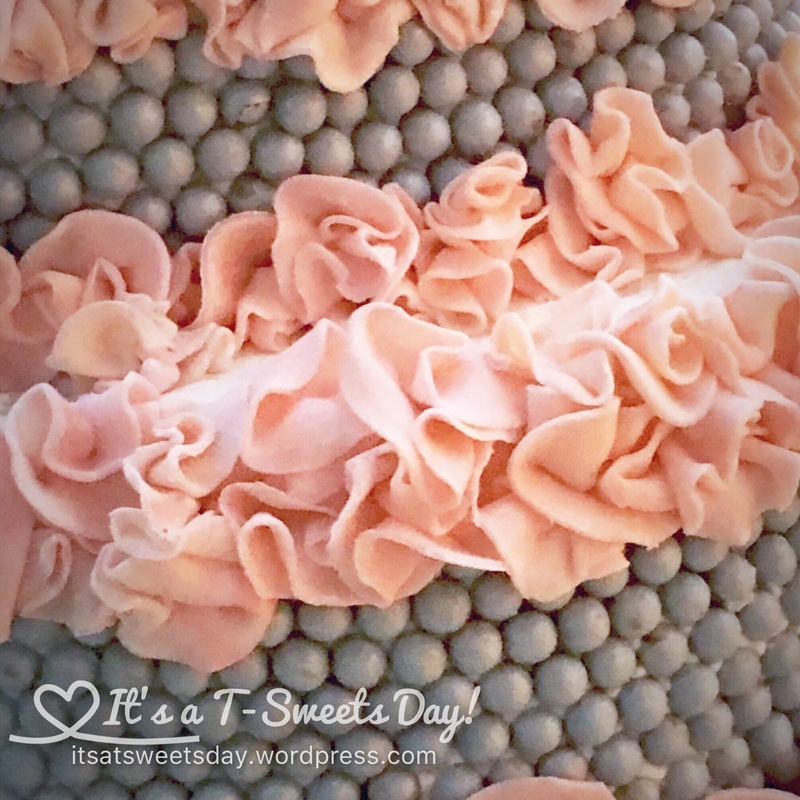 One- little -candy at a time…. And then the ruffles were added one-little-fondant-ruffle at a time. It wasn’t hard, it just took longer than I expected. When I finished late at night, I had been looking at it so long that I really thought it was ugly. But as a little sleep always changes things, in the morning it was gorgeous again:)! 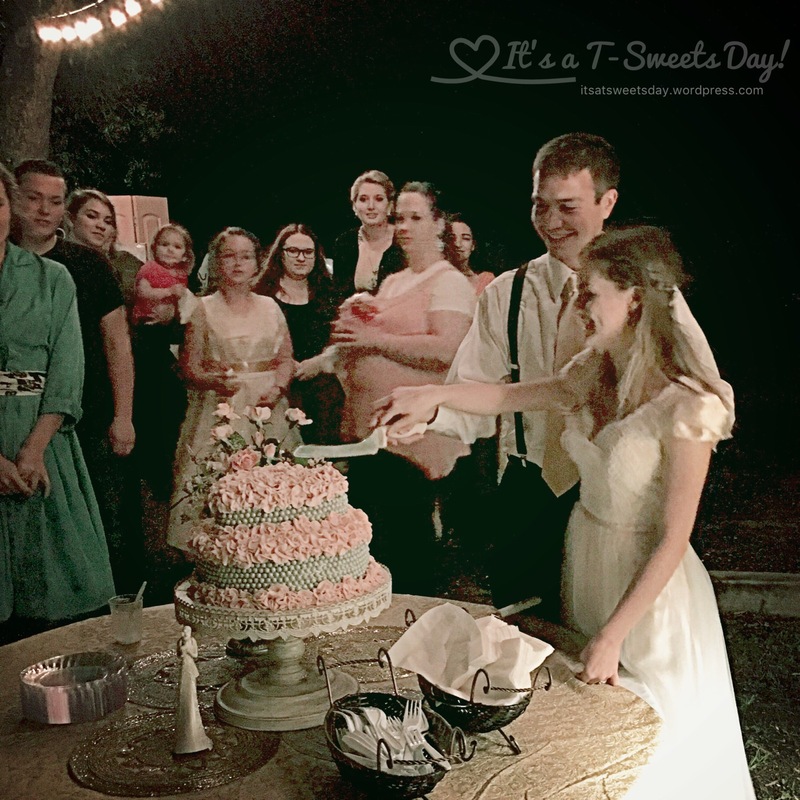 Small Miracles—We had a little tender mercy miracle for the reception. As we were setting up outside, the wind started to really blow. The tablecloths and boxes were blowing away. We had to place chairs over the tables and just go inside and hope it would calm down. We waited a few hours. About an hour before the reception it calmed down and we went out to hurry and decorate. Then it started to rain. Ugh! In Arizona you don’t pray for rain to stop. It is a blessing for every little drop. But I must admit that we all said a little prayer of gratitude for the rain, but please temper the weather just around the reception. We went out and continued with faith to set up in the rain. 15 minutes before the reception started, the rain quit and a rainbow appeared in the sky! I hope you had a SWEET weekend as well. Thank you for dropping by. It is beautiful. I can appreciate your lovely details. I learned to decorate cakes when I was sixteen. Even when I don’t do it for long periods of time, it all comes back to me. Thank you Lori! Cake decorating is like riding a bike, you never forget how to hold the bag of icing:). Beautiful cake!!! You never cease to amaze me! Glad the weather cooperated for all of you.